Students spend quality time with a senior citizen chatting and playing Apples-to-Apples. On Tuesday, Nov. 20, Landisville Middle School celebrated a longstanding tradition, the “Acts of Kindness” experience. Faculty and students at the middle school planned a morning of events to inspire, encourage and involve students in efforts and activities to benefit others, the community and the environment. The day helps students think about what they can do to help others and to improve the world in which we live. Some of the activities coordinated include: making dream catchers for adults and children in area homeless shelters; making coloring books and activity books for children in need; preparing gifts and treats for local shelters; making place mats for residents in area hospitals and hospices; and playing board games with area senior citizens. Some students helped beautify the Landisville campus by raking leaves. Some students wrote letters of thanks and encouragement to men and women in our armed services, to rescue workers, and to friends and family. Some groups organized materials for the public library. In addition, as part of this biennial Acts of Kindness day, LMS collaborated with students from the Landisville Primary and Landisville Intermediate Centers. 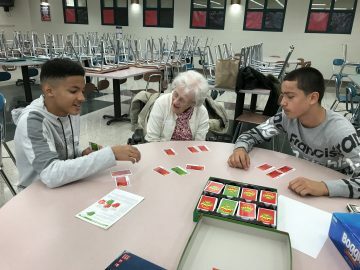 LMS students were partnered with first and fifth graders, as well as other elementary classroom students to guide them through friendly and fun activities, perform valuable community services, or create cheerful cards and crafts for children and adults in need. Some LMS students also led younger students through meaningful STEM lessons.